I left Garden Key at dawn in hopes of making Key West with some daylight remaining. There was a 15-knot southerly breeze blowing through the anchorage carrying the promise of a fast passage. I set the #3 genoa and full main and sailed off the anchor, following the eastern passage that I had seen the ferry taking the past few days. It looked shallow, but there was over 6 feet of water all the way through. Three other sailboats left that morning, and every one of them took the other channel, which is fair enough since the chart shows a shoal all the way across the path that I took. If I hadn’t been there observing the channel for a few days I would have chickened out and went out the way that I came in. I got a wave and a thumbs-up from one of the construction crew that was restoring the walls of Fort Jefferson as I went by. The seas were a bit confused once I got out from behind the protection of the fringing reefs of the Dry Tortugas, but I still made very good time, mostly averaging around 5 knots. I had 70 miles to cover, so I was at about the minimum speed that I needed to make landfall before dark. I thought that I could pick up a good push from the Gulf Stream on the outside and was tempted to go that way, but the confused seas were making me sick and that was the determining factor that caused me to choose to sail north of the Marquesas Keys and enter Key West harbor from the north. The water would be smooth with the low islands and reefs to break the sea, but I was afraid that I was going to slow down. I didn’t need to worry about my speed. The wind kept picking up through the afternoon and I soon found myself close reaching with a single-reefed main and looking for even less sail. Around 1500 I tucked in the second reef into the main and started thinking about changing down to the working jib. My speed stayed in the 6-knot range all day, which is moving right along for a Contessa 26. I let the windvane do all of the steering while I kept watch from the companionway trying to stay out of the sun as much as possible. The entrance to the Northwest Channel to Key West harbor came into view in good time. I hardened up and was almost able to make a straight shot right into the harbor, but a little oscillation in the wind at a bad time forced me to make a couple of quick tacks–no big deal for the agile little Contessa. The wind dropped as I closed the harbor, but I kept the main reefed down to make the boat easier to handle and keep my speed down when I entered the anchorage. I sailed deep into the mooring field to the west of Wisteria Island looking for somewhere to anchor because it was the first obvious place that I saw and from a distance I thought that there were boats anchored there. While sailing between the boats it was obvious that they were all on moorings and there was no good place to drop the hook, so I worked my way around the south of Tank Island to the turning basin just opposite from the Coast Guard base. There I found room to anchor between some other widely-spaced sailboats who had dropped their hooks in about 5-9 feet of water. While exploring the edges of the available anchorage I ran gently aground just north of the green “27” daymark. It gets shallow quickly there! It took just a minute to sail free, as I had been able to turn the boat towards deeper water before she stopped. I went back and found a spot to anchor in 8 feet of water about midway between the “27” and the southern tip of Wisteria Island with about 20 minutes of light remaining to tidy the decks. What an uncomfortable anchorage! One of the biggest hits against Key West in my mind is the lack of a good anchorage. My spot off of Wisteria Island had decent holding because I was able to drop my anchor on a sandy spot amongst all of the weed on the bottom, and it was adequately protected from the forecast easterly winds, even though they could kick up a chop across the fetch of the turning basin. The tide runs through here at about a knot, so my boat was often sailing against the rode when the wind lined up with the current–a problem remedied by using a second anchor. There were manmade downsides to that particular anchorage, such as powerboats that cut between the anchored boats in that area at all hours. They would kick up a wake, which I could live with, but the high speeds at which they came barreling by just feet from my boat made me nervous, especially when I saw others swimming from their anchored boats. Occasional fleets of up to 24 (the most I counted one morning) waverunners would do the same thing. The seven-tenths of a mile row in to the dinghy dock could be treacherous with all of the wakes kicked up from the sportfishers who plow their way out of the harbor at speeds carefully gaged to keep them from fully planing out so that they throw an impressive half-throttle wake. Use of the dinghy dock in Key West Bight Marina costs $5 per day, with discounts for weekly or monthly passes. I dinghy-pooled with a neighbor, which halved the cost for both of us. I decided to set a second anchor when this thunderstorm came through. This is the fourth waterspout that I saw that morning. 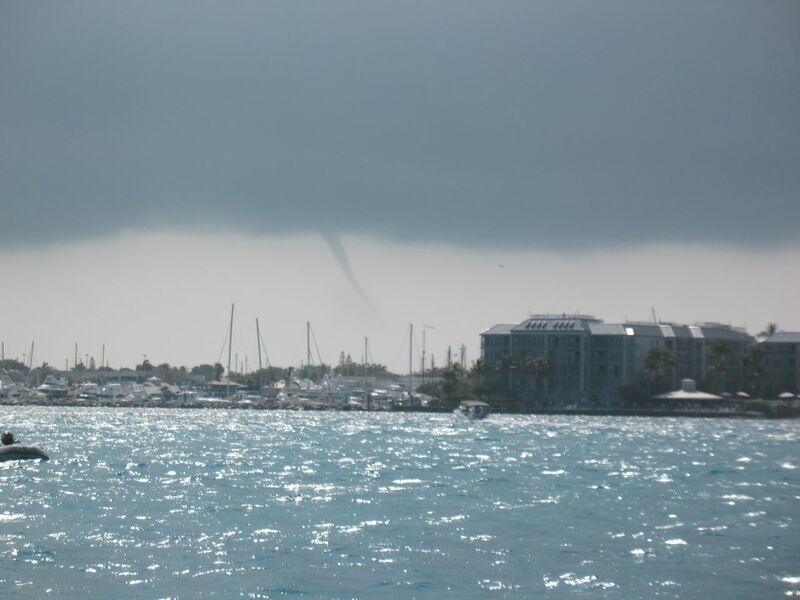 On the third morning that I was anchored in Key West some strong thunderstorms moved in. With the weather radio warning of strong winds I kept an eye on the developing clouds. I still had quite fresh memories of the squall that came through while I was out at the Dry Tortugas, and while I held with no problems out there I am of course always wary of strong winds when I am on the hook. The clouds kept developing and soon I saw a funnel form below one of them. A few minutes later a second funnel appeared. They were off in the distance, but a good sign of the strength of that particular storm. I decided to set a second anchor–a 33 lb (15 kg) Rocna–just to be sure that I stayed put if caught in a strong wind from the storms in the area. I set to work and soon had the anchor ready to deploy. I started the engine and was ready to lay the anchor out when I remembered my camera and took the picture above. About 5 minutes later I had the new anchor laid out in a direction that would hold Cavendysh in deep water if the wind switched onshore. Having the two anchors also meant that I had some degree of mobility and redundancy without actually having to get underway if one of the neighbors started dragging my direction. The strong wind didn’t materialize, but I was glad that I had put out the extra gear anyway so that I didn’t have to worry about how I was swinging when the tide or wind changed.